The Chase Sapphire Preferred easily won our reader vote for best travel rewards credit card, and whether you’re a seasoned points maximizer or just dipping your toes in, you should have a Preferred in your rotation. The Chase Sapphire Preferred is part of Chase’s Ultimate Rewards program. Ultimate Rewards is an ecosystem of several credit cards that when taken together, grant industry-best returns in most shopping categories. We’ll be covering all of the Ultimate Rewards cards in greater detail in future guides, but today we’re focusing on why the Preferred is a great entry point. The Chase Sapphire Preferred is worth getting for its sign-up bonus alone. You’ll net 60,000 Ultimate Rewards points after spending $4,000 on the card in the first three months after opening, plus another 5000 for adding an authorized user (free) once they make a purchase. That’s worth around $1200 by The Point Guy’s latest valuations, or to put it another way, you’re getting around a 30% return on that $4,000 you were probably going to spend anyway. The Preferred’s $95 annual fee is not waived the first year, however. With the Preferred, you’ll earn 2X Ultimate Rewards Points for every dollar spent on Dining (including things like Seamless), and Travel (including things like Uber), which are likely two of your biggest spending categories if you’re a frequent traveler. 2% is the baseline return I recommend everyone earn on every purchase they ever make, but by maximizing your Ultimate Rewards redemptions, these points are worth far more. Shep and I have both cashed in 25,000 points for roundtrip flights to Hawaii, for example. 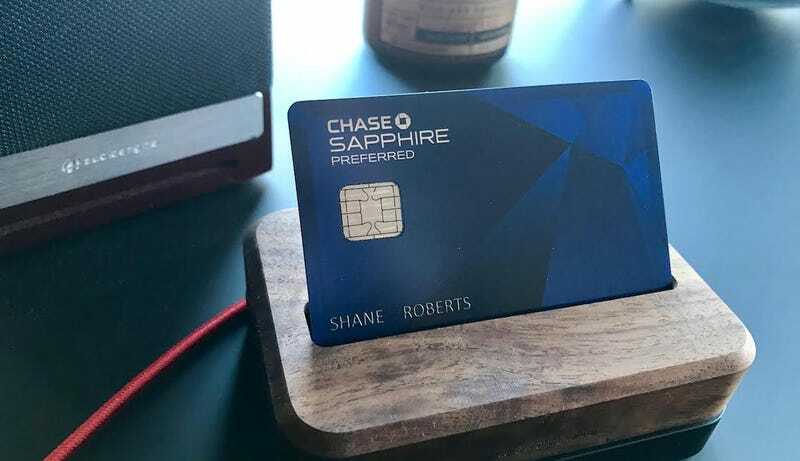 It’s unlikely you’ve managed to miss out on the fervor surrounding Chase’s step-up version of the Preferred, the Chase Sapphire Reserve. The Reserve bumps the travel and dining rewards of the Preferred to 3X, and offers a sign-up bonus of 100,000 Ultimate Rewards points if you apply at a physical Chase location by March 12. After that, it drops to the Preferred’s 50,000 point level. The Reserve’s $450 annual fee isn’t waived the first year, and while it’s offset by things like a $300 annual travel credit, if you didn’t already pull the trigger, you probably aren’t going to in the next few weeks. Either way, you’ll want to get a Preferred for its sign-up bonus. Ultimate Rewards is the best and most user-friendly travel rewards system out there, and the Chase Sapphire Preferred is your step one. Top image features Grovemade, Hawk+Hatchet, Anker PowerLine+ Lightning, and Audioengine HD3 (coverage incoming).